You’re most likely already familiar with data fusion, which is generally defined as the use of techniques that combine data from multiple sources. In contrast, information fusion extends the capabilities of data fusion by adding context to this merged data. Information fusion involves creating and persisting domain metadata, including derived data, to support both human and automated decision-making. Unlike data integration tools, such as products from Informatica, that provide insight on static Big Data after-the-fact during batch processing, information fusion platforms deliver insight in-time or near-real-time. Yes, I understand that I’m tossing in more buzzwords here, but this is to distinguish an information fusion platform, like Objectivity’s ThingSpan, from event processing platforms, such as those from StreamSets, that ingest streaming Fast Data in real time. Information fusion technology instead sits between these tools that handle Big Data and Fast Data to add context and statefulness for IoT applications. At the risk of sounding like I’m inventing a Goldilocks tale of epically strange proportions (This data is too big! This data is too fast! This data is just right! ), let’s look at information fusion through the lens of crime analytics. When you’re trying to catch a bad guy, as in the case of our federal government’s counter-terrorism efforts, streaming analytics platforms like IBM Infosphere Streams are vital in providing insight as events happen. Terrorists are not going to wait for your batch job to be completed, so a real-time response is necessary. On the other hand, much of crime analytics occurs when the bad guy is already in your possession. When a law enforcement agency arrests a suspect, an information fusion platform can merge the streaming data from the current crime with the static data from that person’s entire record to get a cohesive view of the perpetrator. This process can have an in-time or near-real-time response, because the bad guy isn’t on the move anymore. It should be noted, however, that both of these scenarios are important, which is why information fusion technology harnesses the power of Fast Data and Big Data platforms. To use ThingSpan as an example, it bridges this gap in the data pipeline by natively integrating with Spark and HDFS, as well as other open source tools like Kafka. In other words, why take the DIY approach to building a fusion system when you have more efficient and cost-effective out-of-the-box alternatives at your disposal? 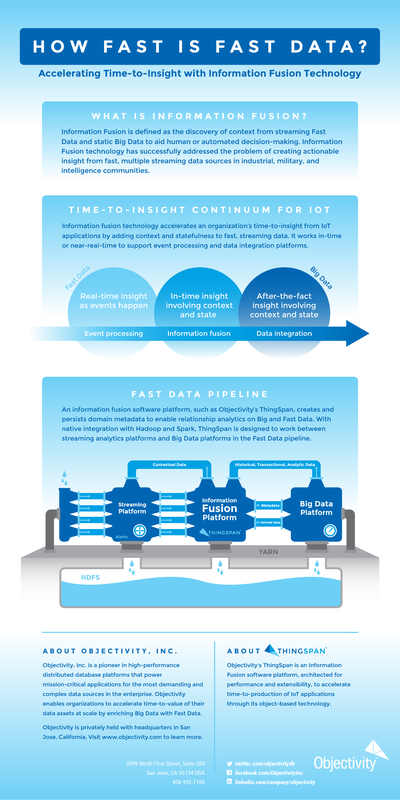 To summarize, below is an infographic which depicts how an information fusion platform, such as ThingSpan, works in the Fast Data pipeline, and what we mean by “fast” in the context of accelerating time-to-insight for IoT applications. 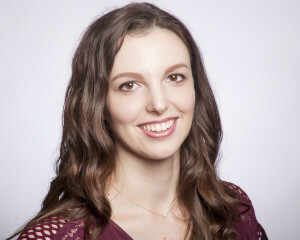 You can visit https://www.objectivity.com/products/thingspan/ to learn more about how our solution can better enable your organization’s fusion system.